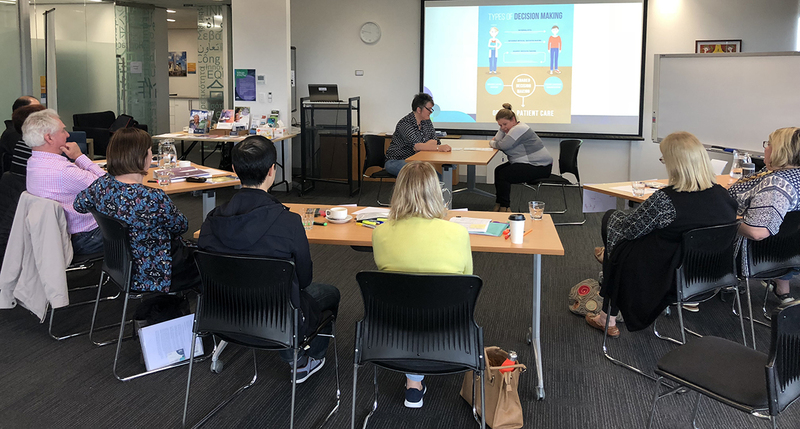 On 27 October the Person-Centred Medical Home (PCMH) Leaders Group came together for their fifth workshop on the topic of the patient-team partnership. The patient-team partnership promotes person-centred care. Patient-centred or person-centred care means involving the person receiving care in all decisions about their health and treating them with dignity and respect. Practicing in a patient-centred way means that the patient, the patient’s family and the care team work as partners to motivate the patient to increase their knowledge, skills and confidence to manage their health. This can lead to healthier patients and better experiences for everyone involved. The PCMH Leaders Group: putting the patient at the centre of their care. Jeannie Knapp (GP), Michaela Lodewyckx (NWMPHN) and Paul Grinzi (GP) ran this session. Paul is a medical educator at Murray City Country Coast (MCCC) GP training and a GP in North Melbourne. What titles are used? For example: doctor, nurse or first name? Who enters the consult room first, the patient or the provider? Who sits where in the consultation? How do you accommodate a patient’s cultural beliefs? Paul then took the group through a session on motivational interviewing. Motivational interviewing is a counselling method that many health care providers use in practice to facilitate behaviour change. This method works best when used as part of a person-centred consultation, when the patient trusts the provider and feels that they are “on the same team”. This process can also be used in a non-clinical context, such as motivating changes in staff behaviour. The group also discussed active listening and using open-ended questions. Research shows that patients often have a one or two minute monologue prepared however providers generally interrupt after an average of 11 seconds. The PCMH Leaders Group will now move into a new phase of the project. The next session will focus on the lessons learned by each practice; feedback on tools, and advice for NWMPHN to support other practices with the PCMH model. If you would like to know more about the PCMH model and how you can adopt it in your practice, please contact Michaela Lodewyckx (Coordinator, Primary Care Improvement) by email: michaela.lodewyckx@nwmphn.org.au.